Kids love to emulate their parents — up until a certain age, anyway. By introducing “green” practices early on, there is a better chance your child will become an enthusiastic recycler and develop a long-lasting appreciation for protecting the earth. Have fun. Before brushing teeth, sing a song about “saving water for the fish.” Have your kid decorate cloth grocery bags with non-toxic pens. Pick out a colorful waste-free lunch box together. Make recycling convenient, with clearly labeled bins located in strategic locations around your home; not just in the kitchen, but in the bathroom (for toilet paper tubes) and bedroom, too. Celebrate America Recycles Day or Earth Day. Teach kids about recycling with Recycling Truck app (iOS, $0.99), or virtually sort materials with National Geographic’s online Recycle Roundup game. Download recycling-themed coloring sheets and crossword puzzles from the Planet Ark. Shop farmers’ markets and teach your kids about the benefits of buying locally grown food. Little bundle of joy on the way? 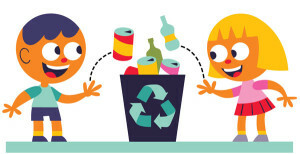 Check out these: 10 tips for raising a Zero Waste baby and ideas for raising a “Zero Waste” kid.